Veronika holds a Civil law degree (LL.L) with great honours from the University of Ottawa and will be completing her Common Law degree (JD) this year. She will join the Gerami Law Team as an Articling Student in August 2014. 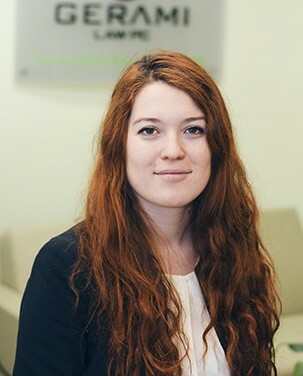 Prior to joining Gerami Law PC, Veronika worked as a trade officer in the Department of Foreign Affairs, Trade and Development assisting in negotiating and analyzing Canada's free trade agreements. She also worked for Aboriginal Affairs and Northern Development Canada as a research assistant, where she monitored and reported on trends in aboriginal litigation. Most recently, Veronika was a Competition Law Officer at the Competition Bureau and was involved in the investigation and analysis of multilevel marketing fraud. During her studies, she actively participated in the university community. She helped establish the Bulgarian students' club, participated in the Constitutional law club, took part of the Bowman moot competition and volunteered in Langevin Morris Smith, a criminal law firm in Ottawa. In her spare time Veronika is an avid jogger training for her first marathon. She also enjoys reading, learning about new cultures and travelling. Veronika lived in Bulgaria and Taiwan for several years and is fluent and capable to serve clients in English, Bulgarian and Russian.